The TUM Track of our Master in Management & Innovation started the year with a live information event about the program on 19 January 2019. During a tour of the new TUM campus, prospective participants had a chance to learn about program specifics as well as the Heilbronn-Franken region as an innovation hub. Our TUM Track participants also made great progress during the second part of their Coaching Series. They received valuable insights into how to receive top scores in assessment centers from coach Martin Emrich, who sent motivation levels skyrocketing by offering a special reward: The highest-scoring participant received a chance to accompany Emrich to the high-profile “Mega Business” event in Johannesburg. The winner of the VIP-ticket was participant Walid Mubarak. During the convention, he will have a chance to meet Wealth Coach JT Foxx as well as Vanilla Ice and Randi Zuckerberg. In the third part of the Coaching Series, participants will cover the latest recruiting trends as well as strategies for negotiating favorable conditions in employment contracts. 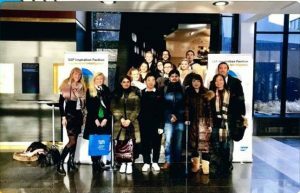 During the second week of the “Financial Accounting” module, participants visited the grounds of the German Horticultural Show (Bundesgartenschau) and toured the offices of international corporations SAP and Atlas Copco. Participants in our TUM Track are also currently approaching a major milestone: The upcoming “Investment & Financial Management” is the fourth and penultimate module in their first semester. It will feature expert advice from investment funds expert Marko Maschek from GiMa UG, as well as a presentation on financial and investment planning by automotive parts suppliers Magna. As another highlight of the module, the group will visit the Weingut Hirsch vineyards as a typical example of the Heilbronn region’s wine culture. Please note: Prospective participants may find detailed information on the Master in Management & Innovation not only online, via phone or during our on-site information events. The EEC will also take the TUM School of Management’s Master Program offering on the road during a series of international conventions. Confirmed stops already include Stockholm, Santiago de Chile, Barcelona as well as Berlin, Frankfurt, Stuttgart and Munich.